ColorPix. Free utility to determine the hex code of any color. This small and free executable utility is a useful little color picker that grabs the pixel under your mouse and transforms it into a number of different color formats. The built-in magnifier function allows you to zoom in on your screen to ensure that you click on the color you really want. 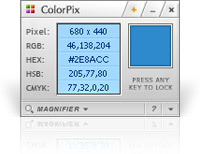 Just click the mouse button or press a key and the ColorPix will copy the hex code of that color to your clipboard. This will be so useful for me! I usually have to take a screen shot, paste it into Photoshop, and use the color picker to get the code. Thank you! This is EXACTLY what I’ve needed for a long time. It’s the perfect utility – just the information I have to have; no more, no less. Hi there, simply became mindful of your web site via Yahoo and google, found that it’s genuinely informative. I will be careful for the city. My business is thankful for individuals who move forward that in the future. Some people might be benefited from a person’s publishing. Many thanks! I have read several excellent stuff here. Definitely price bookmarking for revisiting. I surprise how so much attempt you set to create any such excellent informative website. hey there! , I like your current composing much! percentage most people converse more to do with ones article with Google? I require a specialist in this field to resolve our dilemma. Could possibly be that may be a person! Looking toward help you.